magine installing a service on your cellphone that lets you see all the data – from location to address book info – transmitted by your phone. Or a simple website where you and your friends could have private chats that couldn’t be read by the most aggressive spying agencies. Or a service that lets you know how many tracking codes are on a site before you clicked on it. 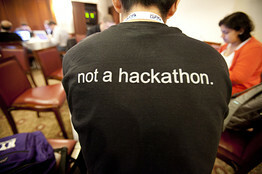 One of the coders at the Data Transparency Weekend models the official T-shirt from the event. Over the weekend, more than 100 computer programmers built those tools and many more at the Wall Street Journal’s first-ever Data Transparency Weekend in New York. The event was an outgrowth of the Journal’s extensive reporting about how companies and government’s are increasingly using technology to collect personal data. The event was designed to promote the creation of tools that let people see and control their personal data. After a weekend of coding, nearly 20 projects were submitted for judging on Sunday. The entries were judged by Alessandro Acquisti, professor of information technology and public policy at Carnegie Mellon, Sid Stamm, Web security and privacy strategist at Mozilla and Andrew McLaughlin, former deputy chief technologist at the White House and vice president at Tumblr. The Zuckerberg/Systrom Memorial Award for Opportunistic Optimism Award: Pestagram, for its blatantly commercial mashup of hot Web technologies Instagram and Pinterest. Best Listener Award: The Price of Free, for the fact that the project was generated by Professor Acquisti’s speech kicking off the weekend, in which he challenged participants to find ways to quantify how much people are paying with their data for free services.